It's time for the Possum Lodge Word Game, yayyy! Oh, wait, no. That's not it. It's really time for Mish-Mash Monday! I have not one, not two, not three, but four (four!) places inside where Fiona and James can drink, yet they are both obsessed with drinking from the birdbath. Sometimes, when the water is low in the birdbath, Fiona will sit in it to drink, but she hasn't let me snap a photo of that pose! Remember my snapping turtle visitor? I haven't seen her since that last post, so she never did lay her eggs in my garden. The other day, however, Fiona and I found a new friend in the garden, this really cute teenage skunk! Noogie! I held back, but of course Fiona ran right up to it. Oh bananas! They were almost touching noses while my mind was going 100 miles a minute doing Olympic-speed mental math ("Hmmm, I have about 10 ounces of tomato juice and Fiona weighs about 7 pounds... what's the formula for calculating surface area?!" — How's that for Monday Maths?!). Fortunately, the skunk seemed very secure in its surroundings and pleased to make Fiona's acquaintance. I did tip toe and grab her up before anything bad could happen, though. Saturday night I saw an opossum on my deck (didn't get a photo as it was dark). I've only seen one once before in my backyard and man it was cute. I love the pale snout and tail and the cute brownish in-between! So honored that so many critters feel at home in my garden. We're still waiting for the official, professional photographer's pictures from my niece's wedding. There should be a cool shot of her, her hubby, and me all dressed up and doing jazz hands (no, really). Until then, this will have to do. You can't see everything unusual about me in this photo, so I'll tell you: My hair is French-braided and I have ringlet curls (curls! I didn't even have those as a kid!). My fingernails were painted purple (yep, at age 43 I gave in to peer pressure and went with the other women to have my nails done for the first time in my life. I'm a gardener; I don't do nail polish!). I'm wearing a dress (a dress, people!) and 3-inch heels (I'm normally all about sensible shoes). And though it isn't obvious, I'm wearing the kinds of makeup I never do, thanks to my niece's other aunt's winning ways with product: eye shadow, lipstick, eyeliner, and blush! Good gravy, by the time I was all decked out, I felt so unnatural I muttered under my breath that I felt like I was cross-dressing! This served as great amusement for my brother-in-law the rest of the day, I believe. The rest of these photos were taken a few weeks ago. ...as well as close up! It's about 6 ft. tall. 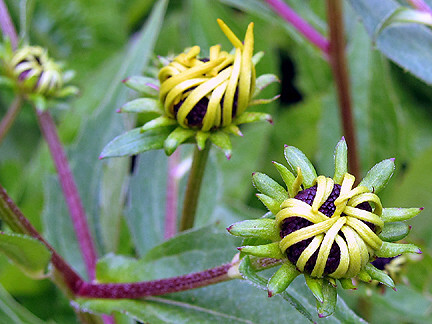 I love how black-eyed Susans' petals clasp the bud before they open. ... and looking due south. The three rose of Sharons along my driveway are doing well. I got them 5 years ago from a fellow master gardener and they looked like twigs. Now they're about 5.5 feet tall. They take all kinds of abuse and keep on blooming! 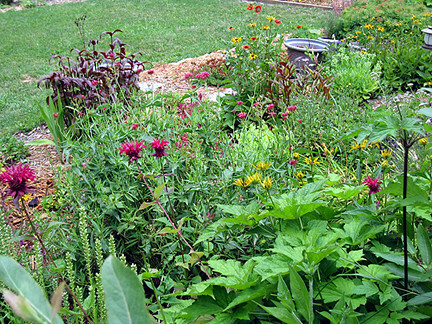 Absolutely beautiful garden beds full of lush blooms. I have always loved the way the black-eyed Susan's hid behind their petals, looking for all the world as though too shy to bloom. Good to hear your close encounter with the skunk ended so well. Tomato juice didn't work on my pups--I finally had to get some enzymatic cleaner (Nature's Miracle) to rid my pup's once and for all the distinct odor of skunk. Haha - you get far more interesting animals visiting you than we do. We get just foxes, squirrels and a badger! Your black cohash is sure wonderful! I'm with you-no dresses and never have I had my nails done but there is a place in time for that and sounds like the wedding was it! good for you as I think you look lovely in the makeup and doodads. 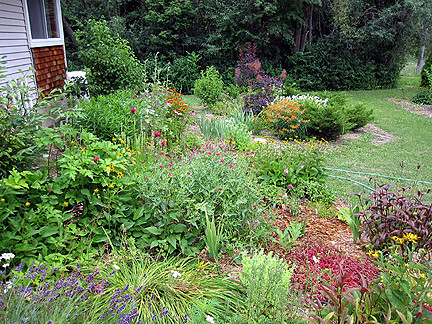 Your gardens are so full of color right now, Monica; beautiful! 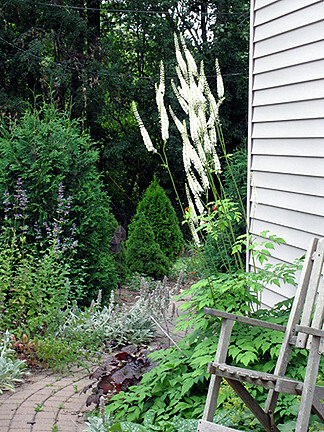 ...love the black cohosh; darned, now I'm going to have to dig up even more grass for all the plants I still want. ...now I'm wondering if it's my cats who kept tipping over the ceramic birdbath and broke the base. I didn't think they were strong enough. I feel your pain regarding the makeup, dress and heels. From reading your other comments, you'd think we gardeners were a pretty shabby lot;) Actually you look very nice all decked out. Fun to do once in a blue moon. 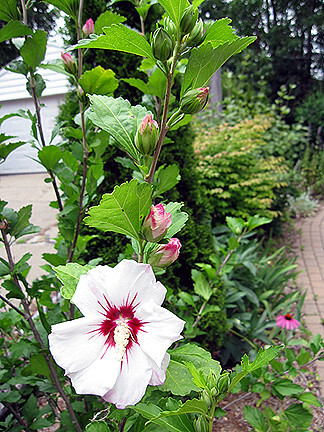 Your gardens are looking beautiful. You still have lots of stuff blooming. Wow you shur cleanup real purdy. I can imagine how unusual it felt to be all dolled up. I welcome most all except skunks into my garden. They are just too much trouble when they spray a poor silly dog that runs up to it to see why it is in her yard. I hope your tomatoes ripen before first frost. 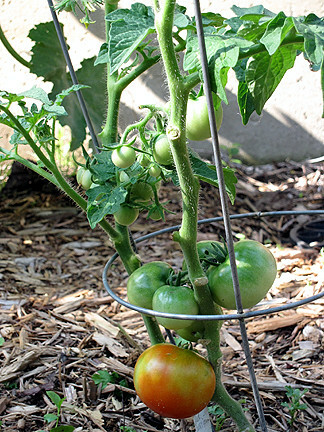 Tomatoes have been slow to ripen here too since it has been so cool. Guess the water in the birdbath taste like chicken. I miss our skunk friend that lived at the old house. It was great buddies with our cats and ate in the breezeway with them. The only time it gave me a scare was one night after listening to a cat persistently scratch at the door I got out of bed and let the skunk in. Last wedding I went to I had my hair done up in a French Braid too. I stopped at that - no way is anyone going to paint my nails. The gardens look great. Wish I had kept up with mine this year. I found the mention of tomato juice confusing. I take it (from the other comments) it is supposed to get rid of the smell. But why would it do that? I think you were very brave to dress up for the wedding. (And to have your photograph taken too.) I had to go to a sort of interview a few weeks ago and knew that, if I 'dressed up', I would feel so 'un-me' that it would be a disaster - so I chose to go in my favourite, most comfortable clothes. The only concession was that I sewed up the rip in one of the trouser legs which was the result of a tangle with a bit of metal several months ago. I would guess nieces at weddings might feel differently. I grew a 'Black Russian' tomato once - it ripened sort of stripy. Monica, you are one lucky woman with your cat and that skunk! My long departed cats used to think drinking from the bird bath was the cat's meow (ow!) too. All of your beds look so nice. Mine are kind of end of summer bedraggled now. Love your new look! p.s. love the black cohosh too. Of course those birdbaths aren't just for the birds. They're for the cats. Your garden is so colorful! It looks great. I love the Black Cohosh. What a wonderful blog. I love the picture of your kitties. I have one that has to drink out of the sink faucet!! Your flowers are very pretty. You look great on the photo, Monica! Your garden looks lovely too. 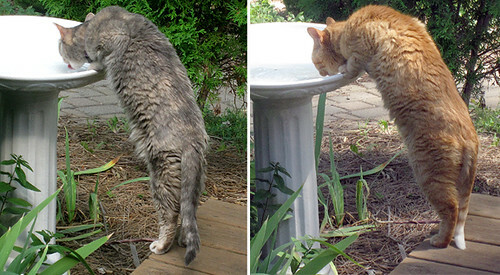 How fun that your cats like drinking from the birdbath! Here, next door's cat comes over to watch me watering my tubs, and likes to catch the water on her paws! Aw, what a cute little skunk Monica - lucky for Fiona (and you) it kept its stink to itself! And wow, you got all fancy for the wedding! Nice photo! I don't mind getting all girlie once in a while, but I'm with you - casual, comfortable, unfussy and un-made-up is my preferred state. Your gardens looks wonderful. 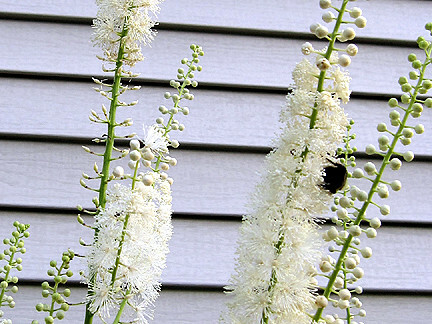 I especially love that black cohosh - they are gorgeous plants. Wow, I'm glad the close encounter with the skunk ended happily. You look great, I like the curls. I have also stuck to simple and practical(which for me is mascara, eyeliner and non-alarmist lipstick), except for my wedding day, where I got "professional" makeup and hair styling. So I am always amused by the photo of the pretty lady on my husband's desk at work. I tell people I only looked like that one day in my life. But what a magical day it was. What a cool looking skunk. Did the PBS in you area used to air those commercials with the skunk roaming through a house that turned out to be the family pet? I brought it up to a professor at the time and he swore that "back in the day" they were a fad pet (and were actually good pets)that people kept once they had the scent glands removed. 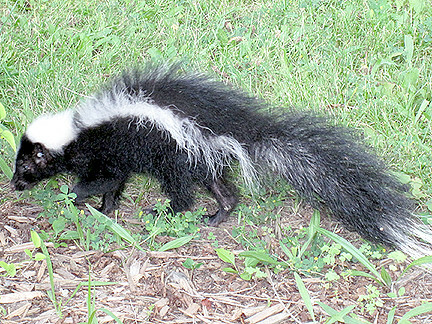 I like skunks but not enough to keep one as a pet. You look lovely in your photo! Would you like some curls? I have nothing but, and would happily donate some! I'm utterly jealous of your beautiful gardens. 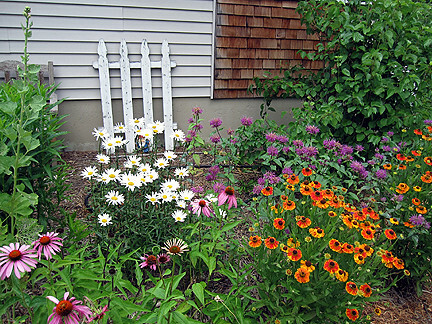 Are those orange flowers heleniums? I saw some at the store the other day and was tempted. Maybe I should just do it!